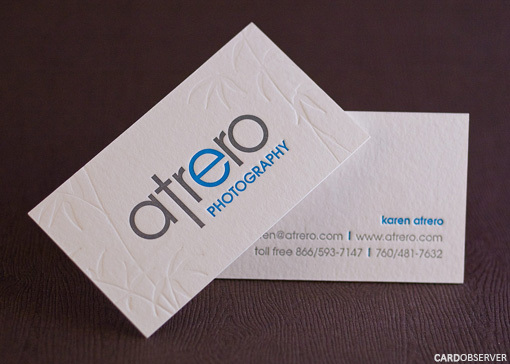 I designed and letterpress printed a set of business cards and gift certificates for Ed and Karen, of San Diego wedding photography studio Atrero Photography, an International Award Winning Wedding Duo. The front of Ed and Karen’s business cards required two hits of color and a blind deboss. Each business card passed through the press a total of 5 times (once for each color/impression, front and back), and they were also printed on 220lb. flourescent white Crane Lettra 100% cotton stock… the thick stuff. Though the Atrero brand features invisible bamboo trees, it feels good to know that no actual trees were harmed in the creation of these business cards and gift certificates. Speaking of invisible, Ed and Karen pride themselves on taking a ninja like approach to wedding photography: working in the shadows unobtrusively to capture that killer shot. Next time you find yourself wondering if ninjas carried business cards, wonder no more. They do, and they are 100% cotton!